Did you know that the honeybee also has a strong association with the heart chakra? The heart chakra also known as Anahata translates to unstruck. In my own journey with yoga, I feel this deeply when I practice. The concept that no matter what is occurring around me or in the world there is a part of me that remains unstruck, at peace, constantly flowing and connecting to all life, and it lies in the center of the heart. Now old texts from India state that the most audible sound similar to the Anahata is the buzzing of bees. The buzzing of bees represents the unstruck sound and the celestial hum of creation. There is even a pranayama practice called Bhramari pranayama, bhramari translates to Indian bee. This breathing practice is also known as humming bee breath, and it involves making a loud humming sound like a bee. I was introduced to this practice through my studies at The College of the Melissae, and it’s a beautiful one. 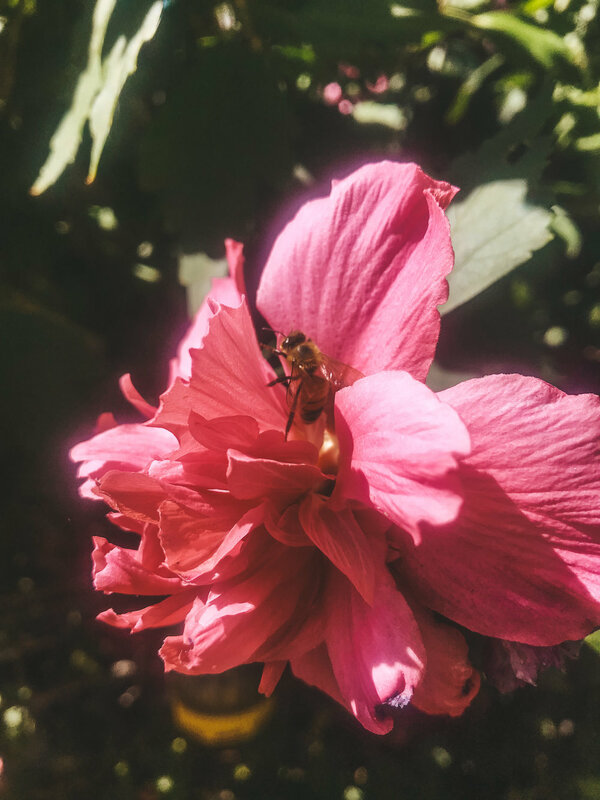 I have introduced it into my own yoga practice as another way to connect to the bees and to open the heart chakra, deepening the feeling of remaining unstruck and at peace within myself. Sit in a comfortable meditative pose. Keep the spine erect. Do not do this in a lying down position. Take a moment to breathe normally and relax the body and mind. Keep the mouth closed and the teeth apart and bring the tip of your tongue to the space behind the upper front teeth. Then exhale slowly, making a continuous humming sound from the back of the throat. The sound should reverberate in the head and you should sound like a buzzing bee! Breath in again and continue the same breathing pattern 6-7 times. Calming to the mind, body, and spirit. Due to the humming sound the individual is more able to enter a state of concentration. Reduces cerebral tension, anger, anxiety, and insomnia. Can help one embody a deeper sense of peace and connection to the world around them. Redmond, L. (1997). When the drummers were women: A spiritual history of rhythm. New York: Three Rivers Press.